It's coooooold in Chicago. No-turning-back cold. As in, this is IT. No more random weeks of 70-degree sunny days, or sunny days at all, for that matter. Cold, windy, gray, with a high chance of snow that will last until late April. 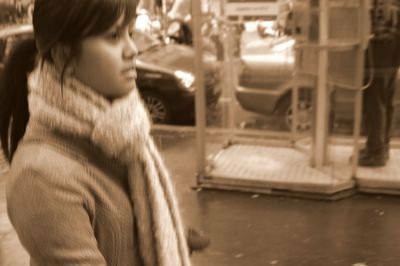 And everywhere I turn, people are wearing heavy winter jackets, boots, mittens, and hats, their scarves blowing about their necks like white surrender flags. There's no fighting it: We're ready for the inevitable. Luckily, stocked freezers and pantries and healthy Midwestern appetites keep us well-equipped for the long winter ahead. I sat at my cold office desk all day cloaked in a shawl, my hands in fingerless mitts, clutching a hot mug of coffee, and still freezing. 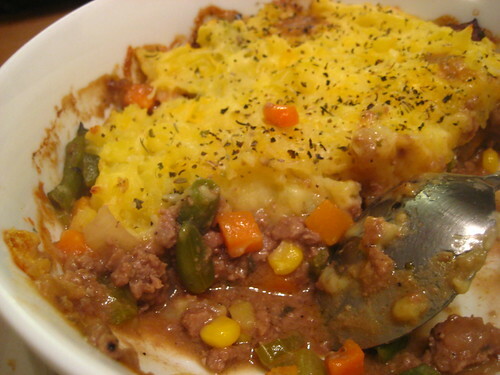 The only thing that could warm me up, besides a hot bowl of soup for lunch, was looking at pictures of shepherd's pies all day. I just hoped the brick of ground beef in my fridge would be thawed by the time I got home. I've come to believe that a good part of the comfort factor in comfort food comes from the dish's simplicity. (I just came about this realization about 30 seconds ago; I could very well change my mind by the end of the night.) Nothing fancy, nothing complicated, just warm and filling and familiar. OK, so maybe not that familiar. 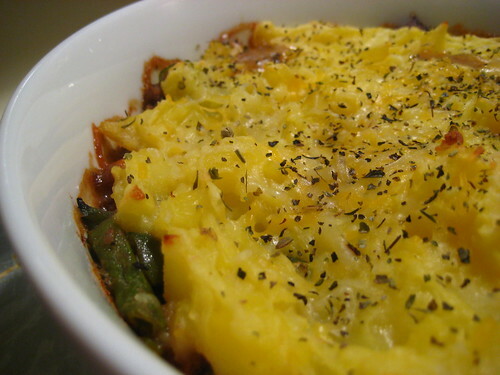 I didn't grow up on shepherd's pie; in fact, I might've had my first shepherd's pie just a few years back. But really, nothing says comfort like a big bowl of meat and potatoes. The pie innards couldn't be simpler: chopped celery and onions and garlic, ground beef mixed with a bit of flour and ketchup and Worcestershire sauce (which I just learned how to properly pronounce today), and frozen veggies. Topped with buttery cheesy mashed potatoes. I won't lie -- it was a little bland. Salt and extra Worcestershire sauce fixed that up. I think next time, I'll prepare this dish the night before and pop it in the oven as soon as I get home from work. Meat + Potatoes + Fast = Ultimate Comfort Food. I can't wait for the leftovers to warm me up at my desk tomorrow. I'll definitely need it. You know, I made shepherd's pie once and it was bland too. But mine didn't have cheesy potatoes or worcestshire sauce. Your convertible mitten/gloves will be done by Thanksgiving!